Text Cannot be Normal Summoned/Set. 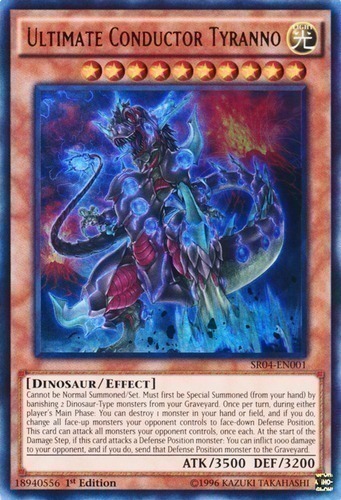 Must first be Special Summoned (from your hand) by banishing 2 Dinosaur-Type monsters from your Graveyard. Once per turn, during either player's Main Phase: You can destroy 1 monster in your hand or field, and if you do, change all face-up monsters your opponent controls to face-down Defense Position. This card can attack all monsters your opponent controls, once each. At the start of the Damage Step, if this card attacks a Defense Position monster: You can inflict 1000 damage to your opponent, and if you do, send that Defense Position monster to the Graveyard.